Celebrate the Holidays with NorthStars! The hit of the holiday season, NorthStars Vol. 1: Welcome to Snowville, is available on comiXology. Join Holly, the daughter of Santa Claus, and Frostina, a Yeti Princess, as they explore the magical wonders of the land of Polaris. Holly and Frostina journey to the subterranean city of Undertown to investigate trouble in Troggie Town, and stumble upon an evil creature scheming right below Snowville… a being that threatens Christmas itself! Written by Jim & Haigen Shelley with art by Anna Liisa Jones you can buy the comic or read it for free on comiXology Unlimited. ComiXology is adding new titles to comiXology Unlimited, like The Black Hood by Duane Swierczynski, Letter 44 Vol. 2 and #9-13 by Charles Soule and Battlestar Galactica: Six #1-5 by J.T. Krul, while select titles are leaving, all starting December 6, 2016. ComiXology Unlimited is the a subscription service that allows customers to explore the amazing world of comics, graphic novels and manga for just $5.99 a month. It’s the first of the month and comiXology has announced new titles being added to their comiXology Unlimited service as well as titles being removed. ComiXology Unlimited is a subscription service that allows customers to explore the amazing world of comics, graphic novels and manga for just $5.99 a month. Check out the full rotation below. ComiXology is adding new titles to comiXology Unlimited like the sci-fi space adventure Fear Agent by Rick Remender and Tony Moore, Mass Effect: Invasion, based on the popular sci-fi video game series, B.P.R.D. : 1946 a series set in the Hellboy universe about a mysterious organization protecting America and the world from occult threats from the mind of Mike Mignola and more, while select titles are leaving CU — the new subscription service that allows customers to explore the amazing world of comics, graphic novels and manga for just $5.99 a month — all starting September 6, 2016. ComiXology Unlimited launched in June 2016. ComiXology announced new selections available today on comiXology Unlimited — the new subscription service that allows customers to explore the amazing world of comics, graphic novels and manga for just $5.99 a month. New selections include this year’s breakout miniseries Faith by Jody Houser and artists Francis Portela and Marguerite Sauvage, Conan/Red Sonja by Gail Simone, Jim Zub and Dan Panosian, Severed by Scott Snyder, Scott Tuft and Attila Futaki, Princeless an Amelia Bloomer Project honoree by Jeremy Whitley, Rosy Higgins and Ted Brandt, Carbon Grey by Paul Gardner, Khari Evans, Hoang Nguyen, Mike Kennedy, and Kinsun Loh, Black Market a series about the superhero body part trade by Frank Barbiere and Victor Santos and more. This month also brings new selections from comiXology’s Submit program! ComiXology Unlimited is available on the comiXology app for Fire Tablet, Android, iOS and on the web. Individuals can start your 30-day free trial. ComiXology Unlimited launched in June and gives individuals access to thousands of digital comics and graphic novels for one low price. In may, the comics world was shaken up with the announcement of comiXology Unlimited, a new service with allowed unlimited curated reading for $5.99 a month. Its been a month since that announcement and comiXology has announced the next round of new comics being added to the service. After much speculation and rumors, comiXology has announced they’re entering the world of digital comics as a subscription with comiXology Unlimited. 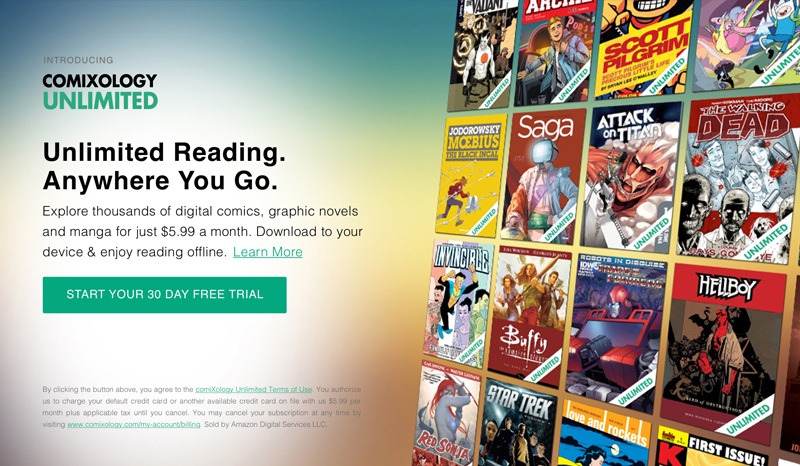 The service provides users a 30-day free trial, and will cost $5.99 and is a “Netflix for comic books.” They enter a market which already has a few other options including ComicBlitz and Scribd, though neither features the potential selection comiXology brings. The service does not include comics from Marvel or DC Comics. Marvel has their own service Marvel Unlimited. The service focuses on comics from everyone BUT the big two and like Netflix, comiXology Unlimited will eventually cycle titles in its catalog, though starts with thousands of issues from dozens of different series. ComiXology Unlimited has a focus to help (new) readers find new titles including recommendation tools such as search filters, home page curation, introductions to various publishers, and even editorial guides. ComiXology Unlimtied exists within the site which allows individuals to still purchase comics and then filter to what’s available through the service. We’ll have further updates as more information becomes available.